In 1937, Katharine Hepburn was struggling. Or rather, the idea of “Katharine Hepburn” was struggling. Though she’d already claimed her first Oscar win in 1933 for Morning Glory, and contributed to the enormous success of George Cukor’s Little Women, a string of financial flops in the late ’30s meant she was proving Marie Dressler’s old adage true: “You’re only as good as your last picture.” Because despite her earlier successes, the common wisdom was that audiences just didn’t like her, to the point that in 1938, she was officially awarded the title of “box office poison” by a group of theater owners. Looking back, it’s easy to see that this designation was incredibly and classically short-sighted; aside from the money woes, which were of course their focus, the films that immediately contributed to that label are among Hepburn’s most fondly remembered today, including Bringing Up Baby and Holiday. 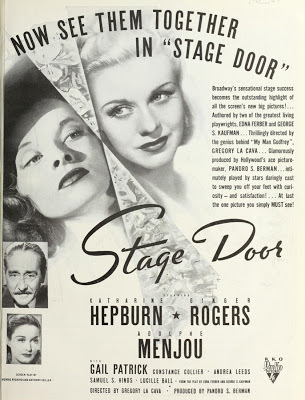 A year prior, in 1937, she’d starred in Stage Door, and, despite being nominated for an Academy Award for Best Picture and pairing up Hepburn with dancer dynamo Ginger Rogers, it was yet another unsuccessful outing at the box office for Hepburn. Though not as beloved today as her pairings with Cary Grant, Stage Door is a charmingly fun comedy with touches of drama, and a plot that mirrors elements of Hepburn’s own experience. Rogers plays Jean Matiland, a brassy chorus girl living at the Footlights Club, a theatrical boarding house for single girls in New York. She toils away at auditions, accepts dinner dates from the boring wingmen of her friends’ boyfriends, verbally spars with other girls in the house—the usual. One of her main argumentative targets is Linda (Gail Patrick), who is dating wealthy theater producer Anthony Powell (Adolphe Menjou), and is keen on showing off the material manifestations of his affections to stoke envy among her housemates. Mr. Powell seems to use the boarding house as a pond for finding both leading ladies and new girlfriends, and ingeniously, simply transfers the name on the card on his standing flower delivery when he’s settled on someone new. Jean’s routine life is upheaved when wealthy society girl Terry Randall (Katharine Hepburn) arrives at the boarding house, seeking to prove herself as a Broadway actress without using the benefits of her family name and connections (that description should sound vaguely familiar). But Terry immediately causes discord among the girls with her tony clothes and vaunted education, not making many friends as she spends a dinner lecturing them about Shakespeare. She does gain an ally in Catherine Luther (Constance Collier), an aging actress and house matron who waxes poetic about the time Sarah Bernhardt sat in a chair in the lobby. To escape the threat to her house dominance, Jean leans in to hook Mr. Powell and all the affectations that that status entails, and is initially successful. But when Terry’s father offers to finance Powell’s new play play, in an attempt to embarrass her into giving up the profession, Powell bites and offers her the lead role, and Terry plays along with the suggestion of an affair to keep the womanizer away from her tentative new friend Jean. Jean views this as a terrible affront though, unaware that Terry was trying to protect her, and the two duel between the two divas is accelerated. Despite the top billing—and their being roommates in the film—Hepburn and Rogers don’t actually share a huge amount of screen time together, as most of their rivalry manifests through various private machinations. In their few scenes, they play off each other well, with Rogers’ deadpan, steely bravado pairing nicely with Hepburn’s haughty optimism. It’s something of a strange role for Hepburn, as it’s fairly straightforward, soft, and tame, in comparison to the headstrong, independent women we typically remember her for now. But RKO was attempting to correct her box-office tailspin, distancing her from the cold costume dramas they believed were putting off audiences. It didn’t work, in a financial sense, and it would be up to Hepburn to pull herself up by buying out her contract at the studio, and going back to the stage for The Philadelphia Story. But Stage Door remains as an example of her terrific acting range, even in a mostly silly piece. 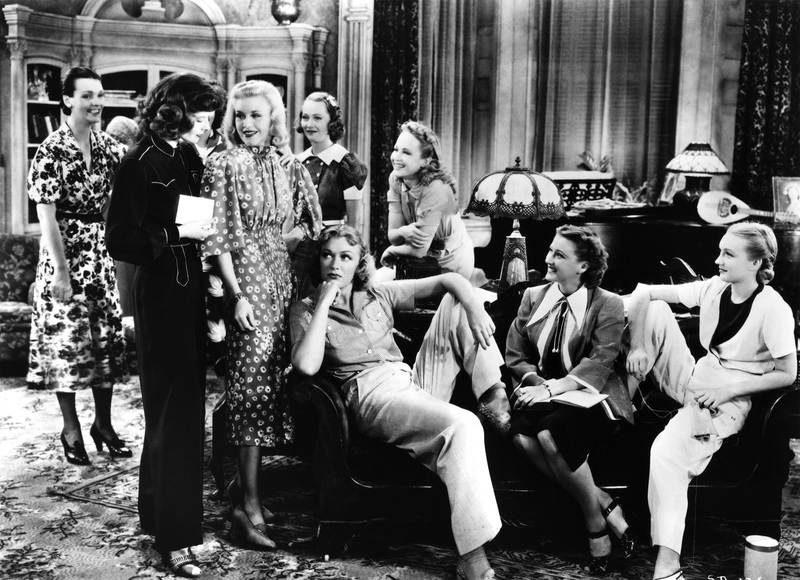 Much of the fun of this film is thanks to the ensemble cast, and the chorus girls living at the boarding house really do act as a traditional “chorus” in Stage Door, providing commentary on the goings-on like they were in a Greek play. Of course, being 1937, we get those in the form of snappy wisecracks and one-liners. The cast is rounded out by now-familiar stars like Lucille Ball, Eve Arden, and a 14-year-old Ann Miller (who had to lie about her age to get her contract), all given a good amount of face time. The scenes set at the boarding house really are a delight thanks to all the energy provided by this vivacious, hilarious ladies. The film takes a turn for the dramatic towards the end, and though they’d been hinting it all along, I was still somewhat surprised at how dark it got. There’s actually one shot in the film, immediately before this moment is revealed, that is quite innovative and technically interesting, using the actual film techniques to communicate a character’s mental state. The lighting suddenly turns high-contrast and unnatural, the camera is slightly askew, and sound echoes somewhat demonically. It’s a jarring effect in a movie that otherwise makes few attempts to get really artistic from a filmmaking perspective, but it works in the context of the moment. Stage Door is a cutesy comedy that doesn’t break many boundaries, but relies heavily on the breadth of its talented main and supporting cast. For both Hepburn and Rogers, it was a bit of a change of pace—Hepburn edging away from the dramatic work that made her a star into the comedy roles that would revitalize her career; Rogers proving she could hold her own outside of her partnership with Fred Astaire. While Stage Door isn’t perhaps the most definitive example of success in either of these pursuits, it was certainly an important stepping stone as both of these fantastic actresses transitioned into another period of their careers. 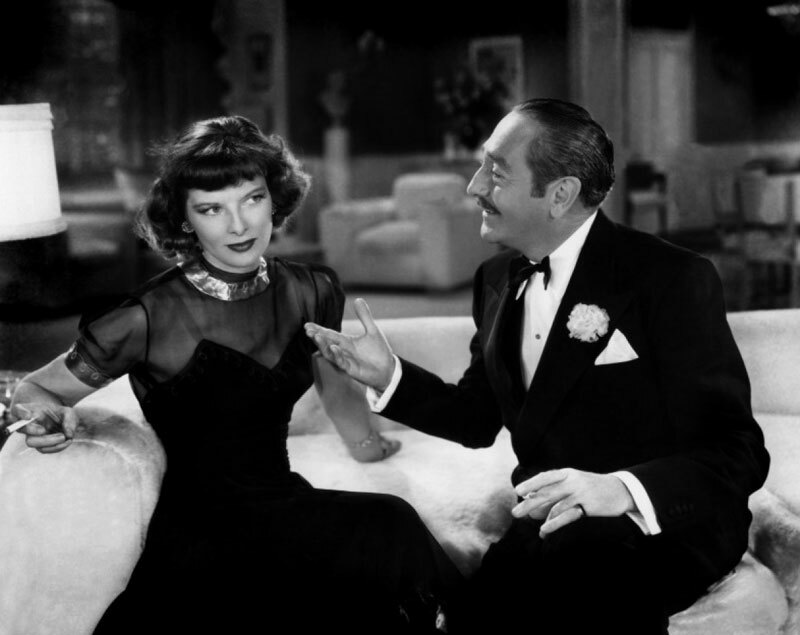 This post is part of the lovely Margaret Perry’s Katharine Hepburn blogathon, which runs from May 10-12. Check out the rest of the entries on her blog! I like that Hepburn always said she had know idea who she was supposed to be in this movie – the human question mark. La Cava just had her play herself, without any tricks. Thanks for your contribution to the blogathon! …great review, Emily!!! I kinda honed in on the ‘Kate ‘vs’ Ginger’ aspect of things over at Gingerology, which was a good move, as you really have thoroughly dissected the film proper. Have an awesome weekend!!! I’ve grown to like this film more with a few re-watches, after initial disappointment at the lack of ‘feisty’ KH. But maybe it’s role like this that allow us to appreciate the classics, and maybe she wouldn’t of had the chance to make them if she hadn’t made Stage Door. Great post – thank you! I’m so happy I just happened upon this post because I’m such a fan of Hepburn’s. And this is my favorite Ginger Rogers performance. I enjoyed seeing the movie poster because you’re right, there’s very little Kate/Ginger. It’s mostly Ginger vs. Gail Patrick (an underrated actress and great lady in her own right). This was a fun read and I really enjoyed your take on a movie I know so very well.